Rolls Royce is a brand that is at the pinnacle of luxury and opulence. Rolls is also believed to build vehicles that last for a lifetime. Even if you have the money, it is not so easy to get yourself a Rolls. However there are a few Rolls across the world that haven’t received the best treatment. Here are 10 such, sad cases. 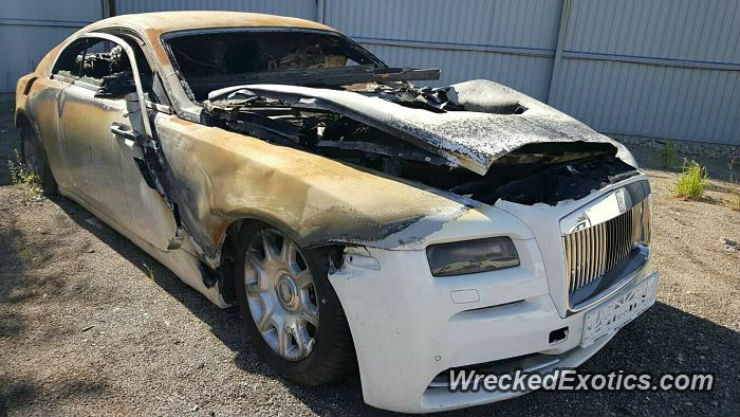 The Wraith is actually a pretty hot and smoking looking vehicle. This one here took it to an all new level though. The cause of the fire is not known so we would prefer not to speculate. But what is known is that the car is completely gutted and there isn’t anything that can be salvaged. No, don’t take the title too seriously. This wasn’t a pimped out Rolls. 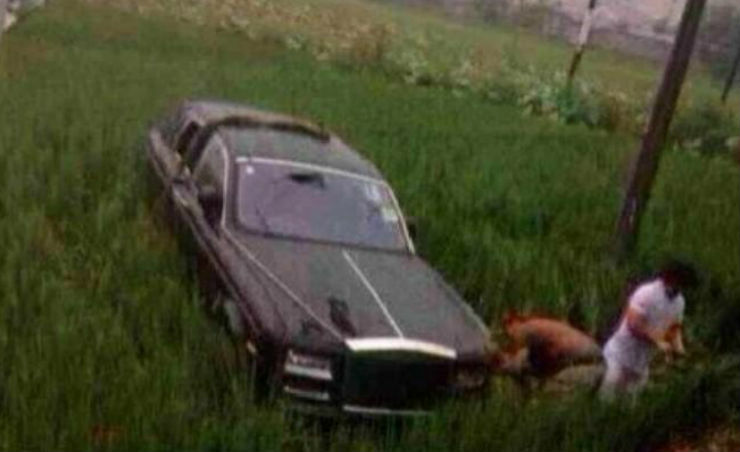 The reason for the rice being in the title is because this owner drove into a rice field. Now whether he was in hurry to get the rice or lost control of the car and landed up there, we don’t know. 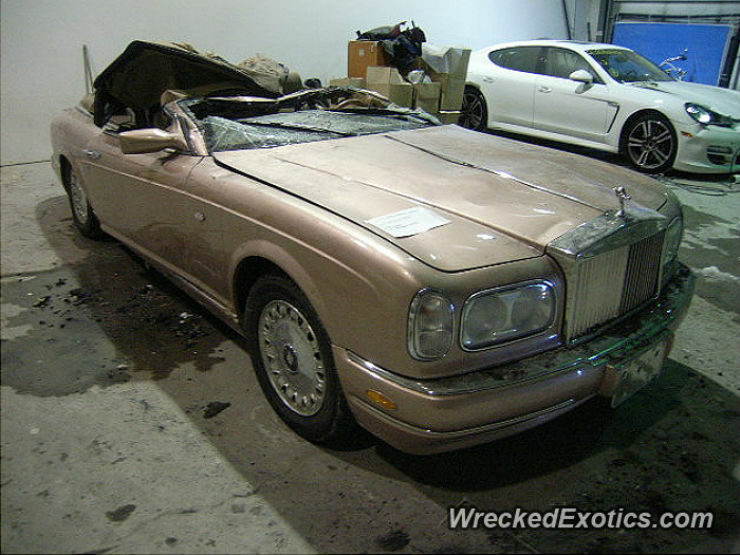 What we do know is that this incident occurred in China and the car was a Phantom Series-II. 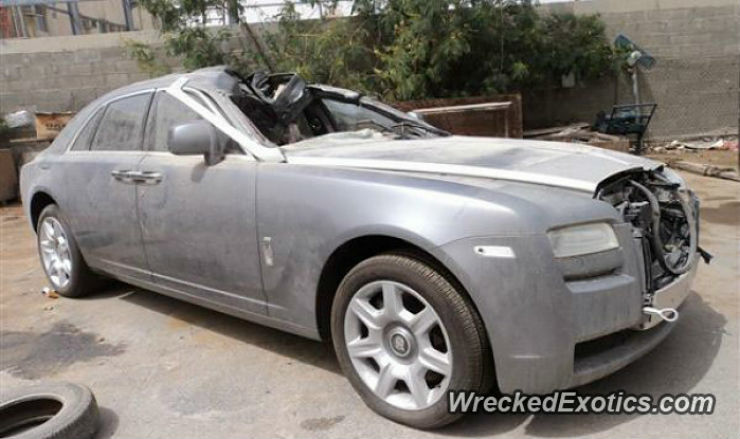 This Ghost is from UAE, or let’s say that this Ghost was being driven there before this incident took place. While we don’t know who was at fault, what is known is that this vehicle happened to hit a camel. Now whether the camel suddenly decided it wanted a ride in the Ghost or whether the driver wasn’t paying attention enough, is tough to tell. However the damage to the roof is extensive and doesn’t look repairable. The Corniche is a rare Rolls. Only 374 units of the same were produced since its introduction in 2000. The one we are talking about is the fifth gen vehicle, which was a 2-door one having a soft top roof. This one here looks like it has gone through quite a rough patch. The vehicle rolled over at high speeds, which is pretty evident given that it is only the top part of the vehicle that has collapsed. Indonesia is a place where flash floods occur and take out a lot of cars. This Ghost pictured here met with the same fate. Since it was a victim of flash floods, the owner didn’t really have a choice. 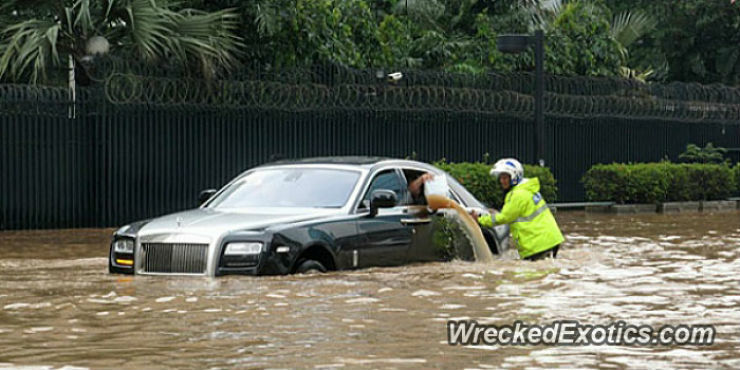 The water level rose so much that it entered the vehicle too, as can be seen in the picture, the owner is trying to remove water from the car by using an utensil.